Way back in 1967, Ansal Group pioneered the concept of high-rise commercial complex in Delhi. Since then, Ansal Buildwell Limited, has driven its dreams tirelessly in changing the skyline of not only Delhi, but also of several other major cities of India and abroad. Through its enthusiastic management team and hard-working craftsmen, Ansal has always been able to foster excellence to meet people's expectations. Today it has solidified its standing as a 360° solution provider in the field of real estate and constructions in the country. Ansal Buildwell Limited is capitalising on emerging market opportunities to deliver high-end facilities and projects to its wide base of customers by constantly upgrading its internal skills and resource capabilities. The business line involves a wide range of products including condominiums, duplexes, villas, row houses and apartments of varying sizes, to give you a lifestyle that is affordable and adorable. 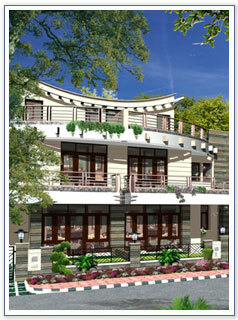 Nothing can be more pleasing than a plush residence nestling amidst a tranquil green ambience. Where everyday at sunrise, you wake up to the chirping of birds unfolding from the womb of nature. Every evening, you warm up in the gym before refreshing yourself with a Jacuzzi under the open sky. Taking the mental make-up of a nature lover as the blueprint, Ansal Basera Estate has been conceptualised and developed as per the needs and lifestyle of Gen Next. It is designed for those individuals who revel in the beauty of a sunset. It is for people who can't stand to be in a room without a window. It is for those who take solace in the songs of birds and the whistling of dry leaves. Adding value to a world class living, the luxurious villas are flavoured with opulent toppings and contemporary designer touches. Belatedly though, Jhansi has got a residential complex so much more elite, and of course natural, than the rest. Located at Nayagaon, 5 km from Elite Chowk on the highway to Gwalior, Ansal Basera Estate is going to be one of the most sought after addresses across nearly 800 sq. km on this eminent North-South & East-West corridor junction of India. Bringing tomorrow's lifestyle today to Jhansi, is the sole objective of Ansal Basera Estate. That is why every villa has been designed with comfort and aesthetics that defy imagination. Added to these are luxurious toppings and contemporary designer touches that indeed add value to a world class living. Planned over a plot area of approx. 133.52 sq. m (1437.17 sq. ft), the ecstasy sprawls over 3 floors. Each villa is furnished with spacious bedrooms, airy living rooms, serene Pooja Ghar, big balconies, roomy kitchen, front and rear lawns and a spacious driveway for parking. Wooden laminated flooring in bedrooms, glazed vitrified tile flooring with granite working in kitchen, English type WC in pastel shade along with modern bathroom fittings, conveniently placed cable, telephone and power points enhance the level of opulence making life even more comfortable. State-of-the-art recreation and fitness amenities like Jacuzzi, personal gym/Tiger's Den (Entertainment area) and a powder room on the second floor provide the right rejuvenation for those who move in the fast lane. The tranquil periphery also features a contemporary luxury club for the members and a specially designed play area for kids. The residents can even bright up their mornings on the jogging track nestling within the Estate. Advanced fire fighting system, motion sensor based security system, intercom connectivity, doorstep shopping, in-complex medical facility, power back up and 24 hrs water supply add more to the luxurious living.